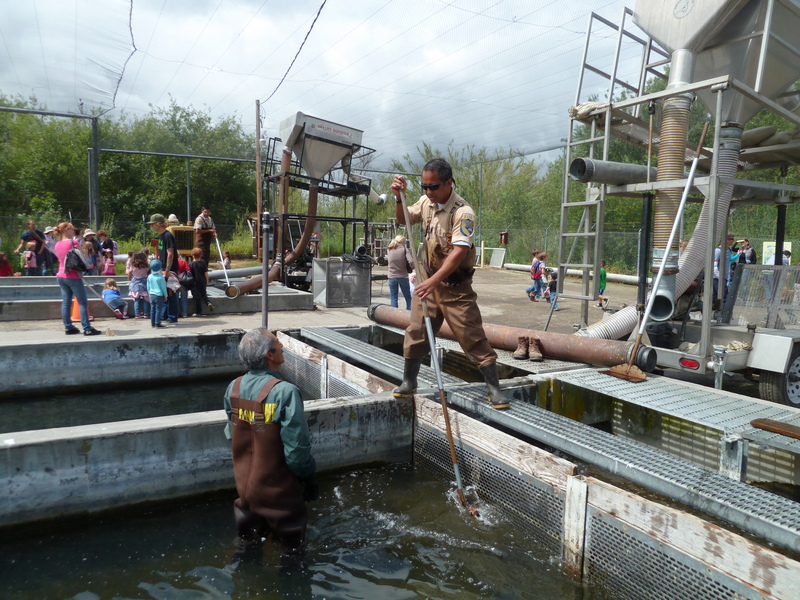 Last week, I organized a field trip to Fillmore Railway and Fish Hatchery. 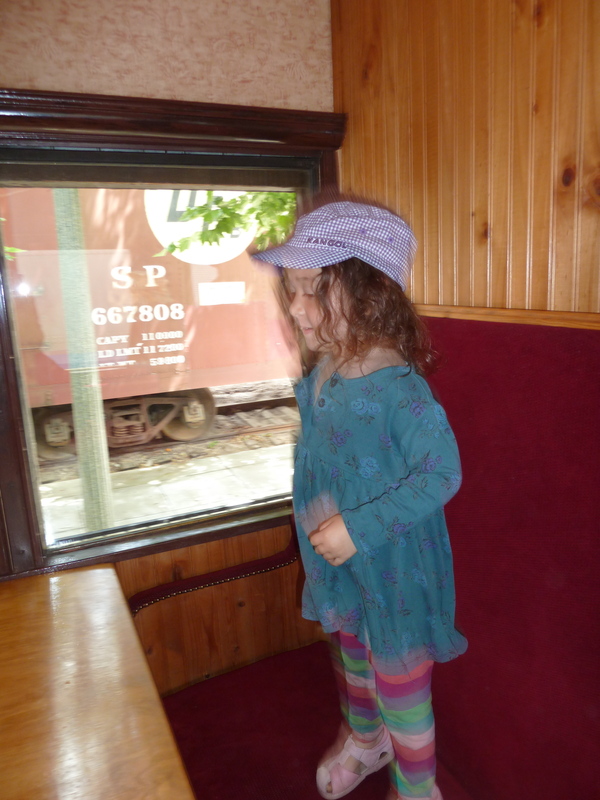 It’s a 15 minute ride on a vintage train to a fish hatchery where children use dimes to pay for fish food to feed trout and see some herons on the other side of the fence. Then, it’s a 15 minute ride back to the railroad station. Here are some pictures of our adventures on that day. I was nervous we were going to miss the train. While we left early and initially thought we were going to be early, we got caught in terrible traffic. On the 405 freeway, there were two car accidents. We moved 2.5 miles in 45 minutes. Once we cleared the accidents, I drove incredibly fast with Mishy telling me to go faster and faster – she didn’t want to miss the train either! 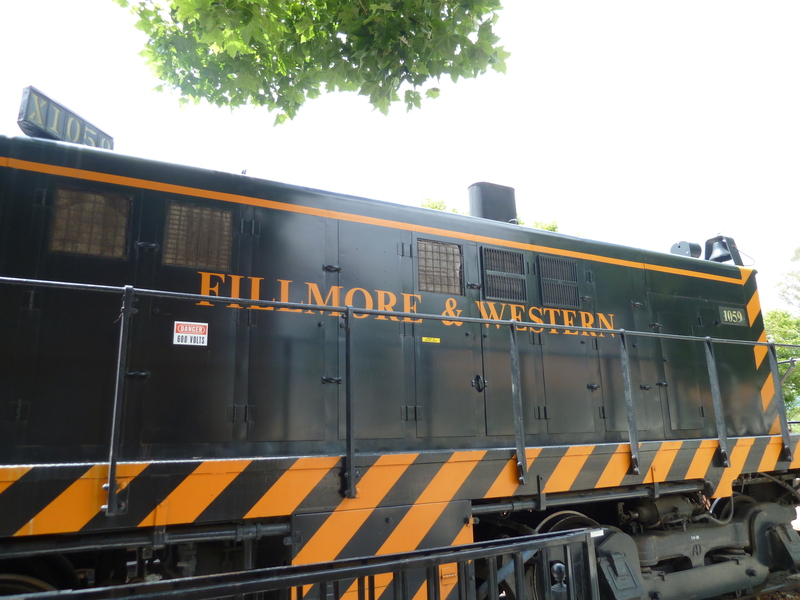 While I am not going to tell you how fast I went because eek – what if someone in law enforcement is reading this – it was so fast that I was able to get to the Fillmore Railway with 10 minutes to spare. A view from the train. We had never been to Fillmore or driven along the 126 West Highway. 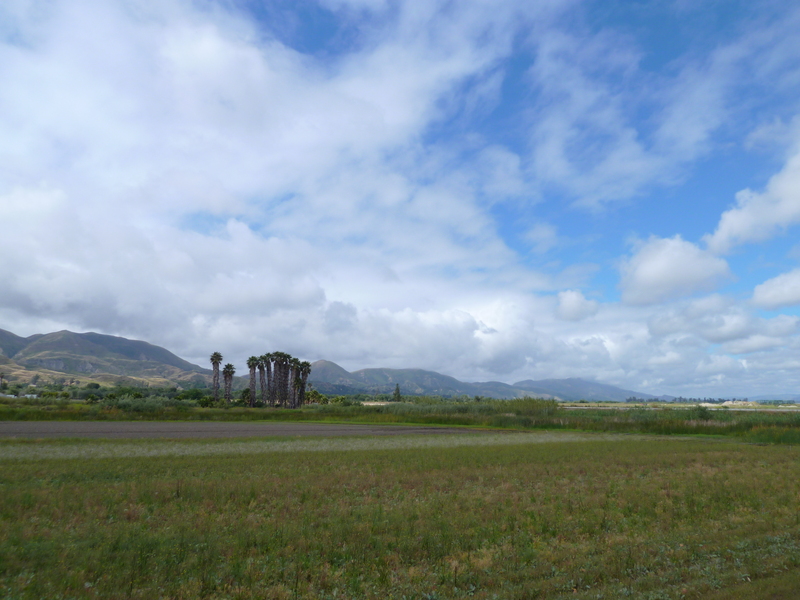 It is a beautiful drive, passing orange farms, Lake Piru and nurseries. Fillmore itself is a quaint town that seems to have retained all of its charm. It’s filled with antique shops, tasty Mexican Food restaurants, and a City Hall with nice bathrooms and of course, the vintage trains. Mishy said she wanted to move to Fillmore and I entertained the thought. (We’ve been having a great deal of problems with our landlord where the police were called last month because the manager committed battery against me. We’ve been dealing with ongoing harassment, child harassment and endangerment for two years now. My husband even got bitten by a dog while protecting our daughter’s friend who was over and playing the backyard. I will write a post about all this in the future once our case with the City Attorney is resolved. Needless to say, my family has been thinking about moving.) Fillmore seemed like an ideal place to live. Mishy, with purpose, walking to the fish hatchery. 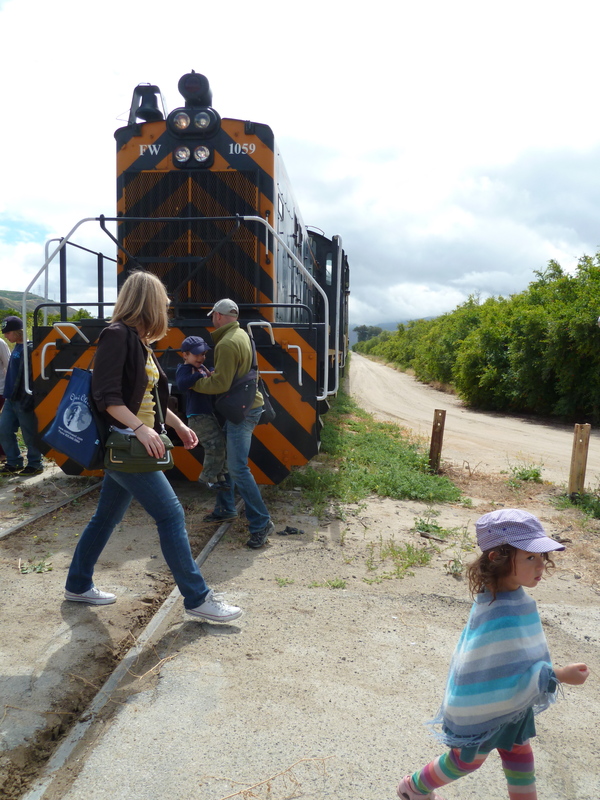 Once the train stopped, we got off and walked a short couple of blocks to the fish hatchery. I forgot our dimes. Sarah and family, who joined us on the field trip offered to give us her dimes and together with what seemed like our endless supply of dimes, we fed the fish. 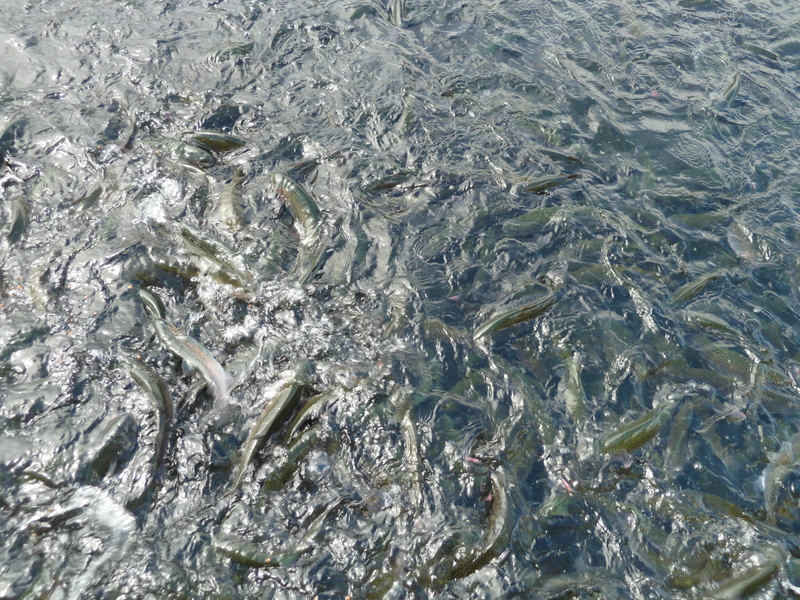 The trout jumping for food. Mishy loved throwing large handful of fish food for the trout. She eventually threw her cup into the water. 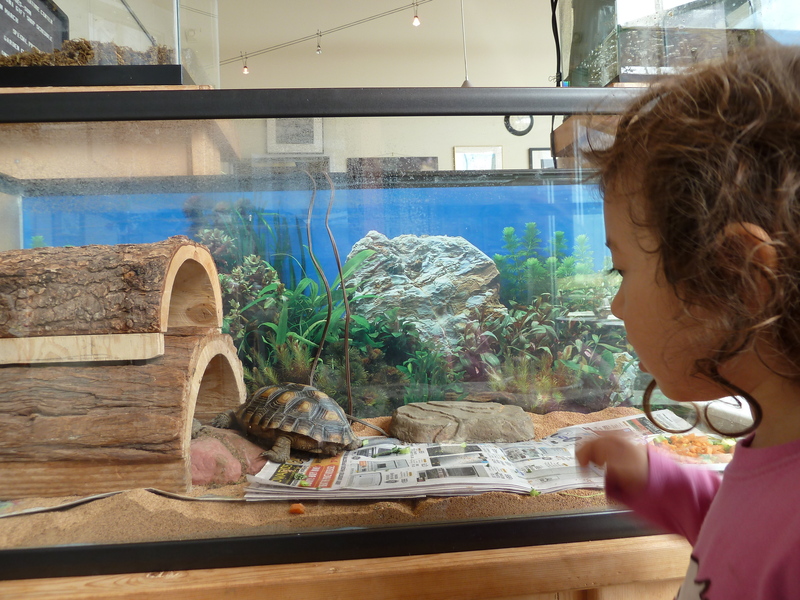 She said she wanted the fish to eat all of the crumbs. Luckily, the cup was non toxic. 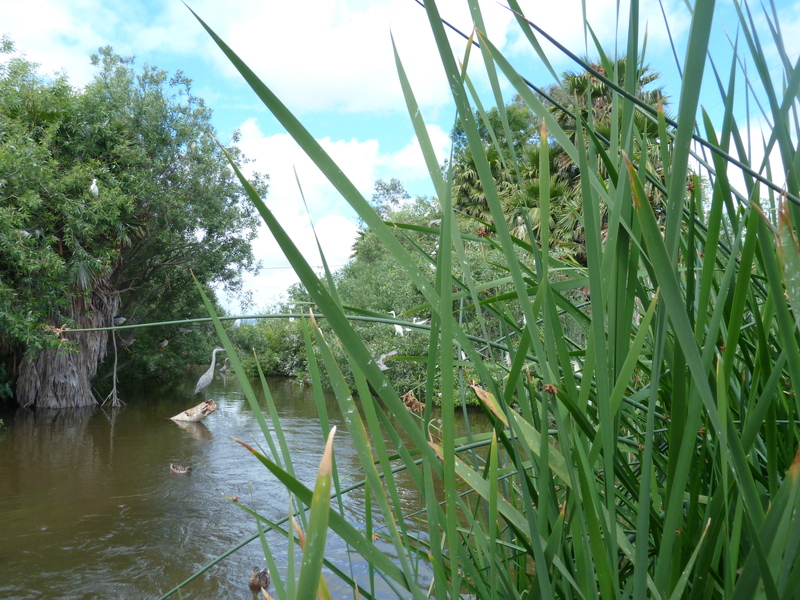 The herons and ducks waiting for the fish. On the other side of the fish hatchery were herons and ducks, enjoying their luck at being so close to a fish hatchery and waiting for some escaped fish. 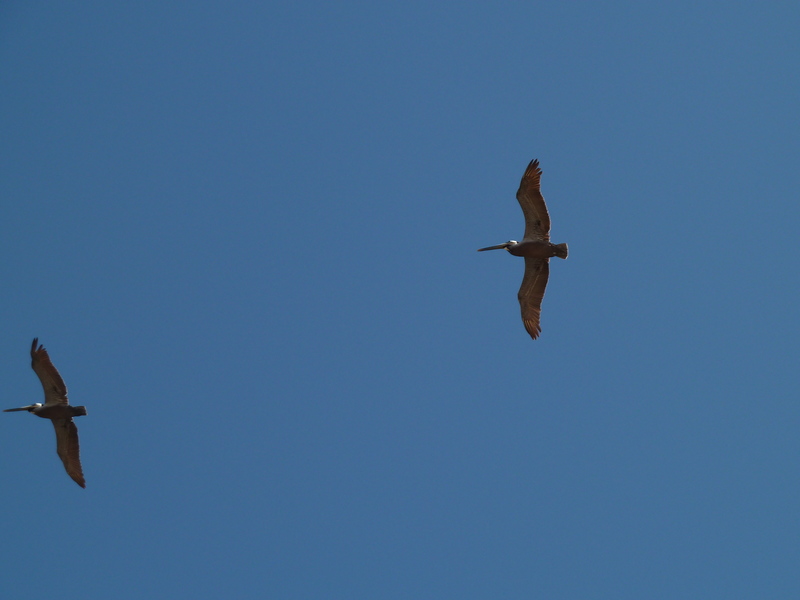 It was incredibly peaceful watching them. They were as equal a draw for the children’s attention. 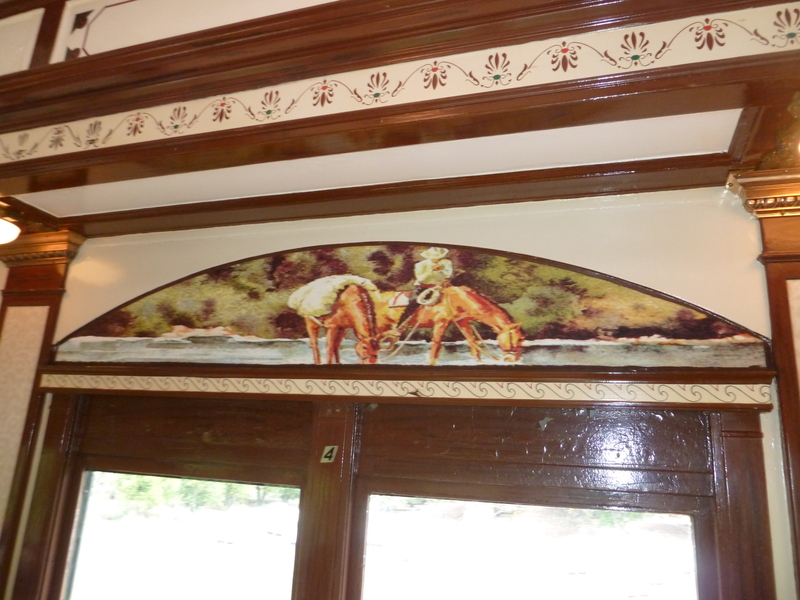 Horses on top of the windows of the train. Mishy hanging out on a chair in the train. 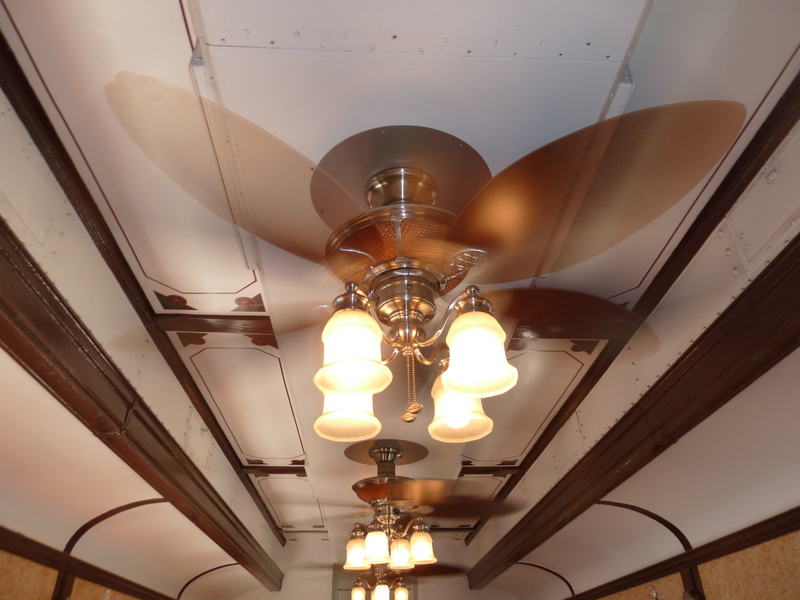 A ceiling fan in one of the cars of the train. 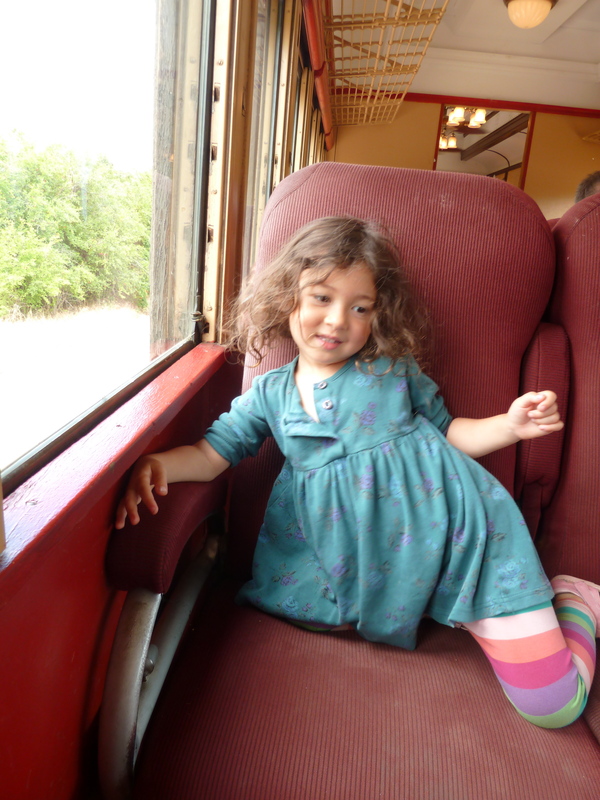 Mishy jumping on another train seat. The train also featured a car that was completely outdoors. I was too busy enjoying the train ride to take pictures of that car. 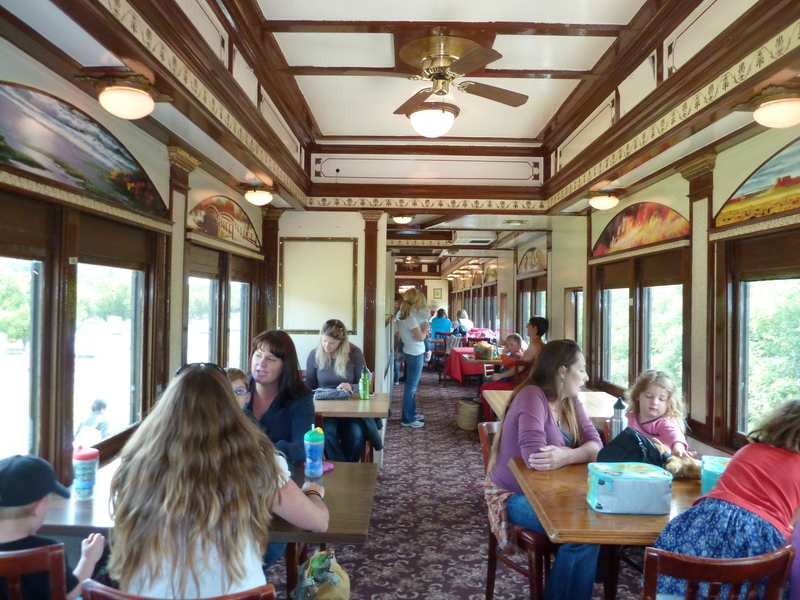 While it was a bit of a long car ride for us – normally, it would take just over one hour, but took us an hour and a half, it really was worth the traffic to experience the train ride, fish hatchery, spend time with friends, and get to visit Fillmore. 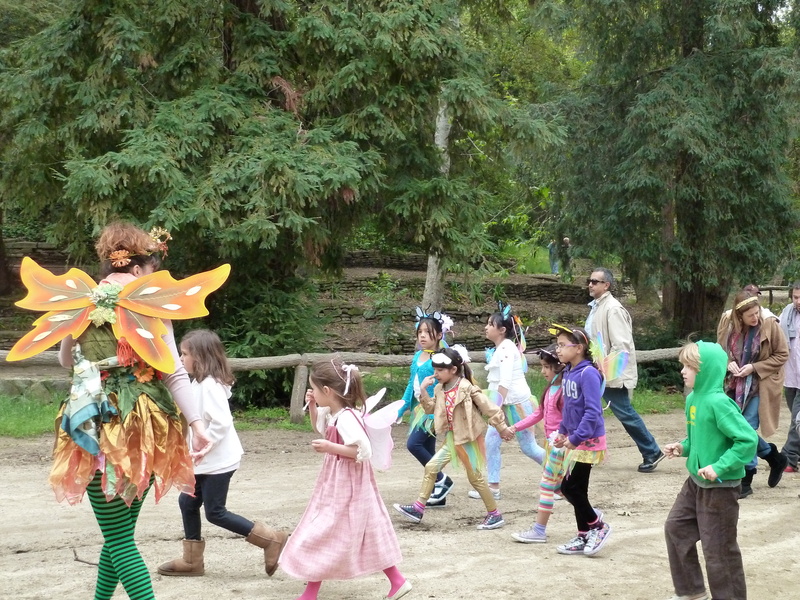 This festival sounds extremely fun, festive and the Children’s Nature Institute is an incredible organization devoted to bringing nature to under-served children in the Los Angeles area. 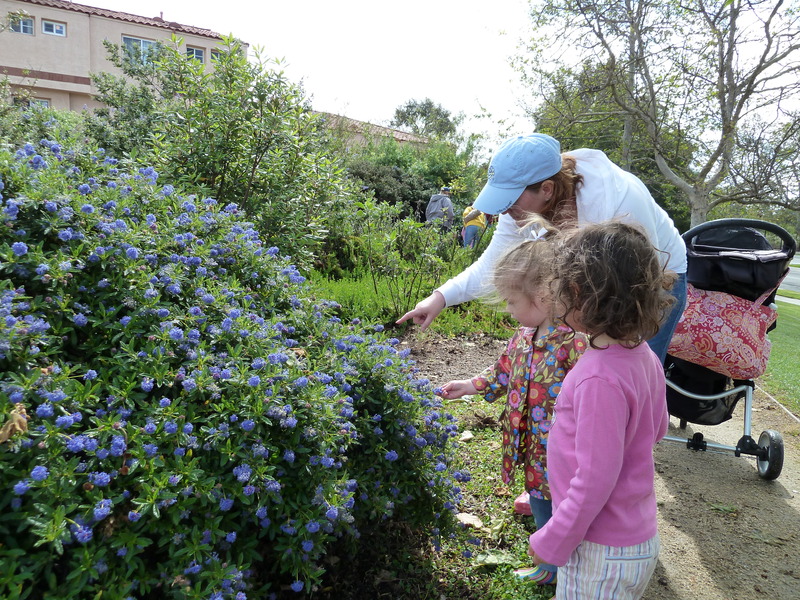 At one point, I was in training to be a docent for Children’s Nature Institute and have organized a nature walk for one of my groups where Kelly, lead a walk through the Malibu Lagoons. It was a beautiful day. Please go to this Saturday’s Kids Rock Festival. You and your children will have a great time together! It’s free and if you donate as little as $5, you can win some terrific prizes! How great is that! Did you know that June is National Get Outdoors Month and June 11th is the official commemoration of National Get Outdoors Day? 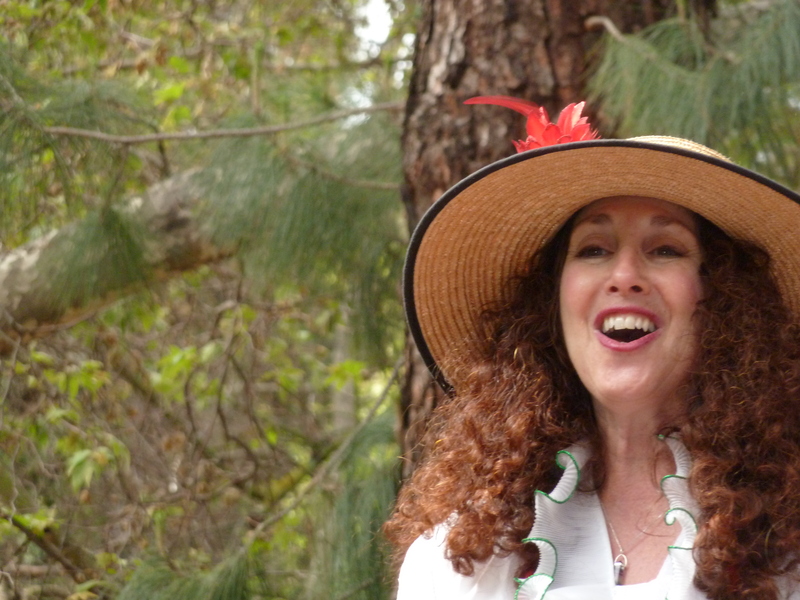 benefitting the Children’s Nature Institute (CNI)! Emcees Kenton Duty (Disney Channel’s Shake It Up) and Zach Callison (who just filmed the lead role of “Dylan” in Rock Jocks, played “Douglas” inHannah Montana, and part of the class of Are You Smarter Than a Fifth Grader?) 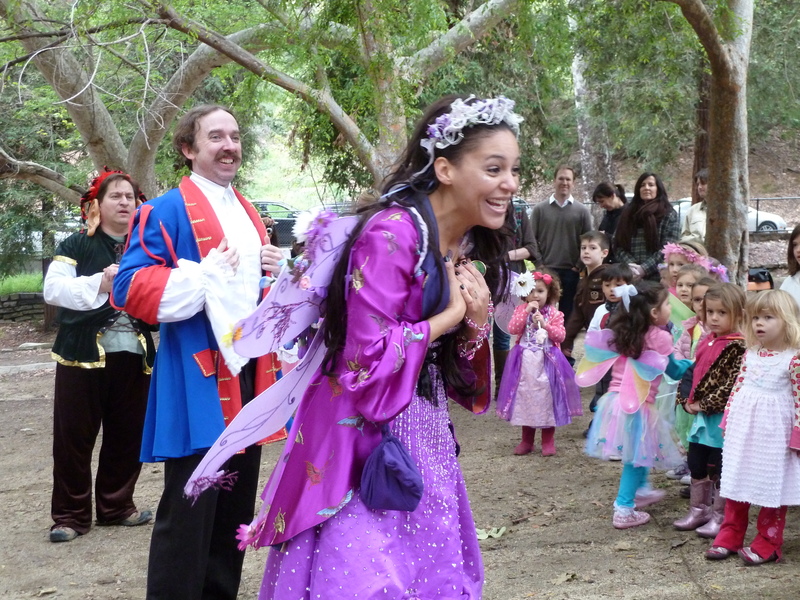 will announce our amazing family-friendly performers. We can’t do our work without your contributions and support. 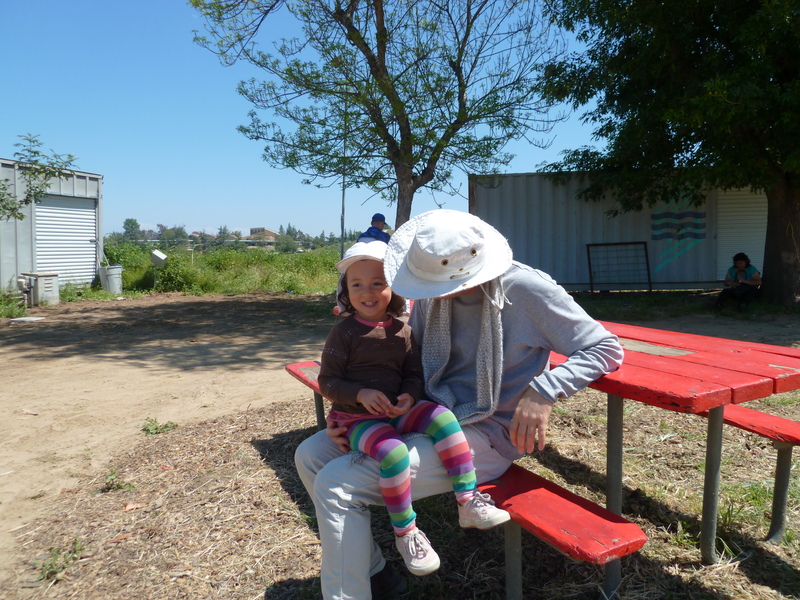 Thank you for helping the children of Los Angeles get outside for a change! 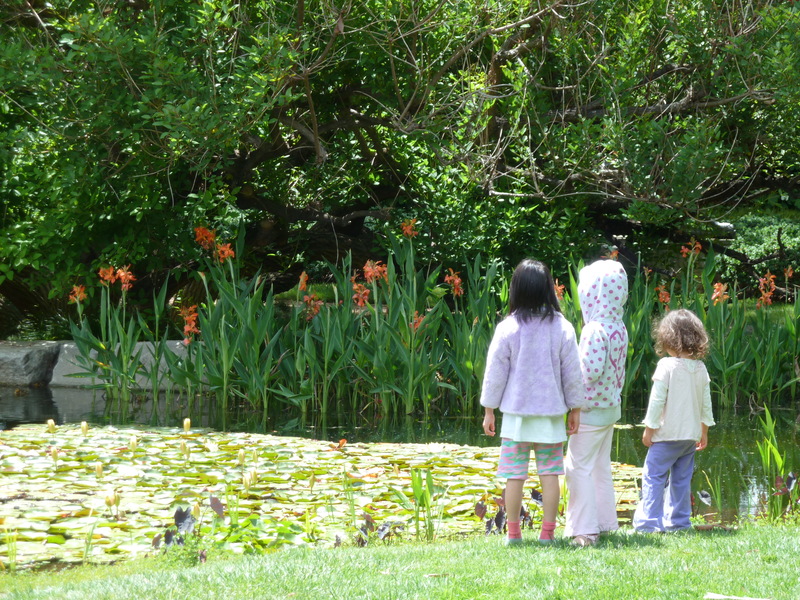 I arranged a field trip to the Norton Simon Museum in Pasadena, CA. 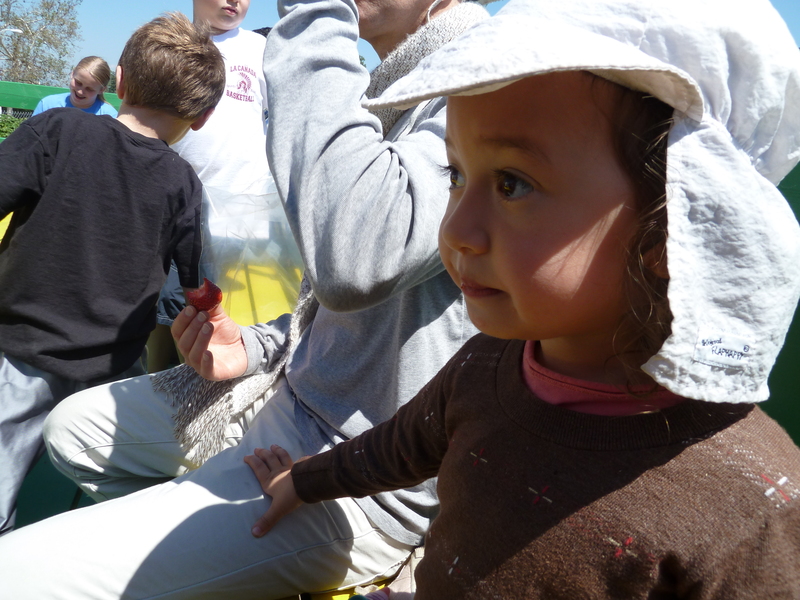 Here are some pictures of our time in the sculpture garden. 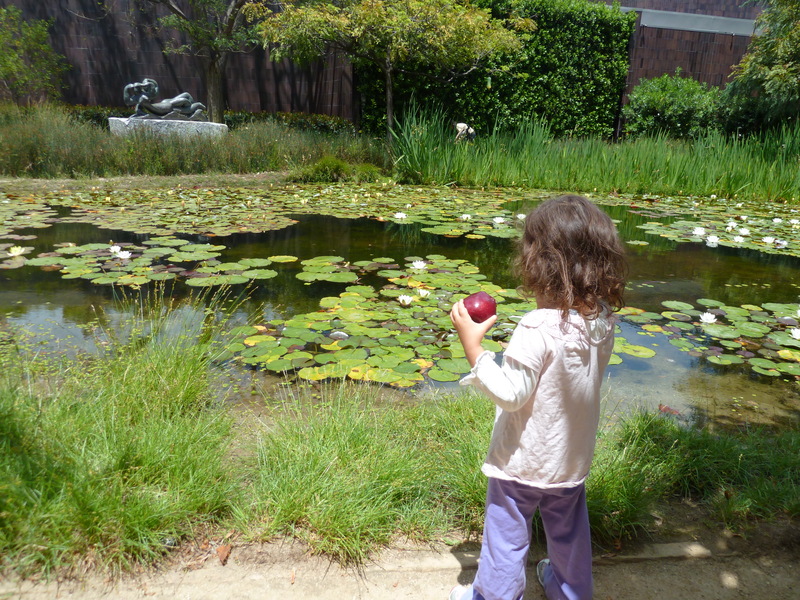 Mishy by the lily pond, eating her red apple. 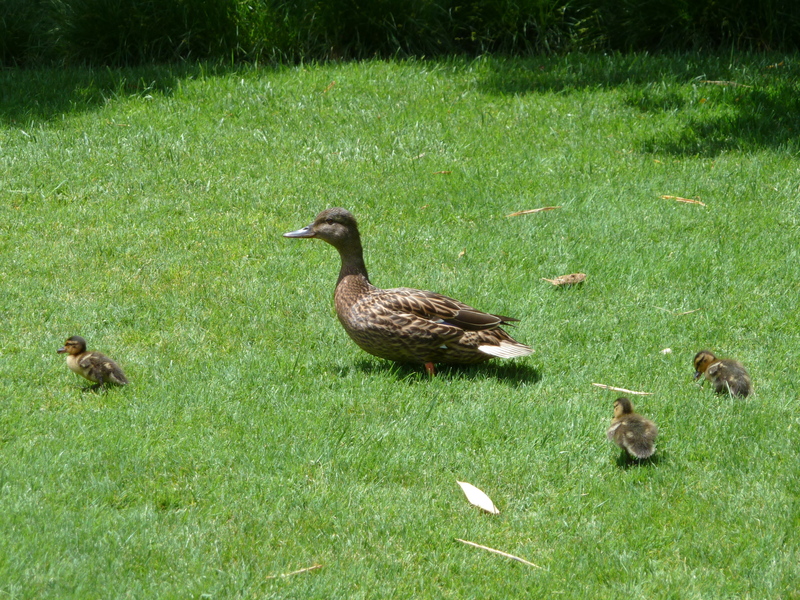 A mother duck with her ducklings. 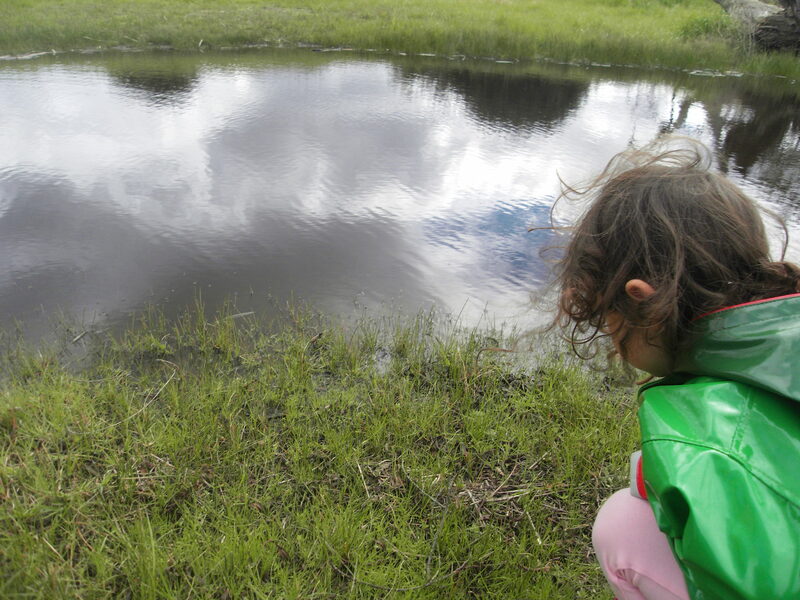 Mishy with Y and J watching the tadpoles. Mishy and I love going to art galleries. I let her decide what she wants to see and then we talk about what we see in the paintings and sculptures – the different colors, shapes, what she sees in the painting, what the painting might be called, what do you think the artist is trying to convey or not, any feelings that come out of seeing the painting? I don’t think there is a right or wrong answer, because art is subjective and it’s just fun looking at art together and also be in nature. 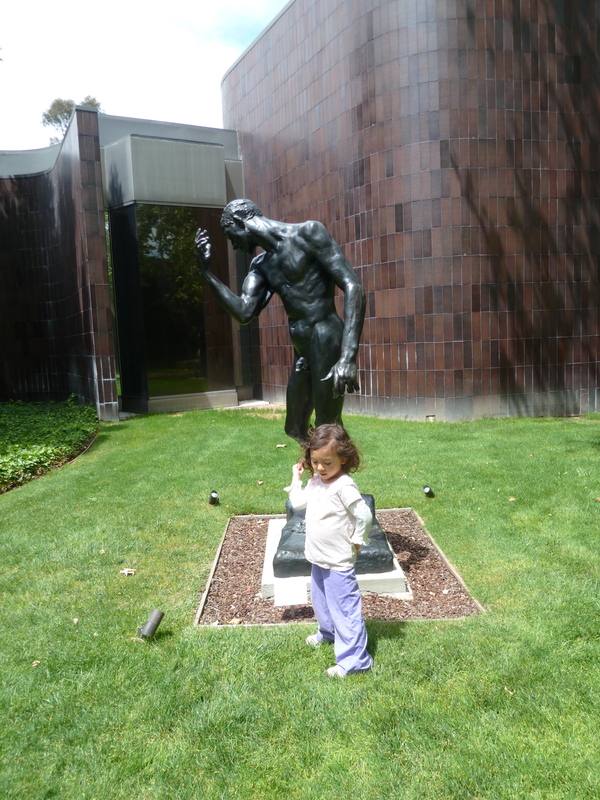 The Norton Simon Museum has a beautiful and peaceful sculpture garden. Mishy inspired by a Rodin sculpture. I am a bit behind in my posts. I started a new yahoo group and quickly organized a lot of field trips. Now that the group is getting solidified and I’ve already organized 18 or more field trips – I’ve lost count, I can get back to blogging! 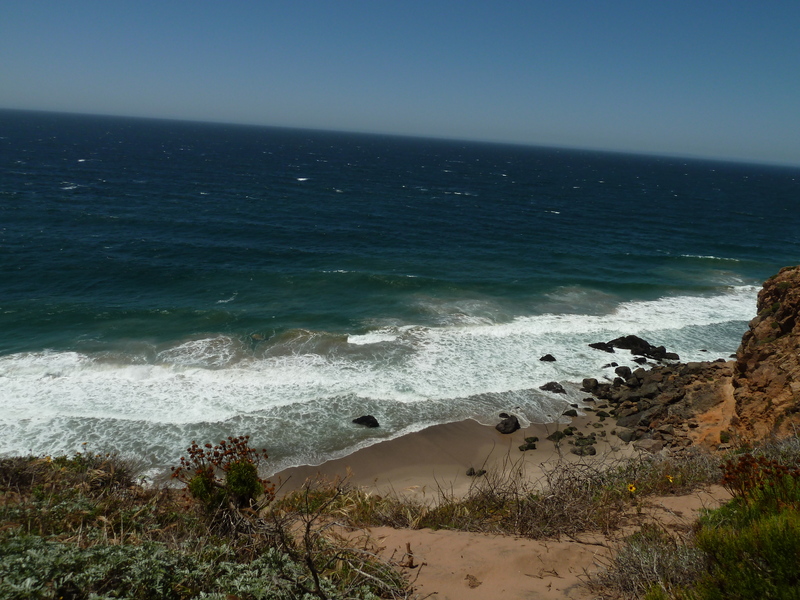 Point Dume is a beautiful short hike with the ocean breeze following you and smell of the sea wafting in the air as you climb higher and higher along the ridge of the mountains. 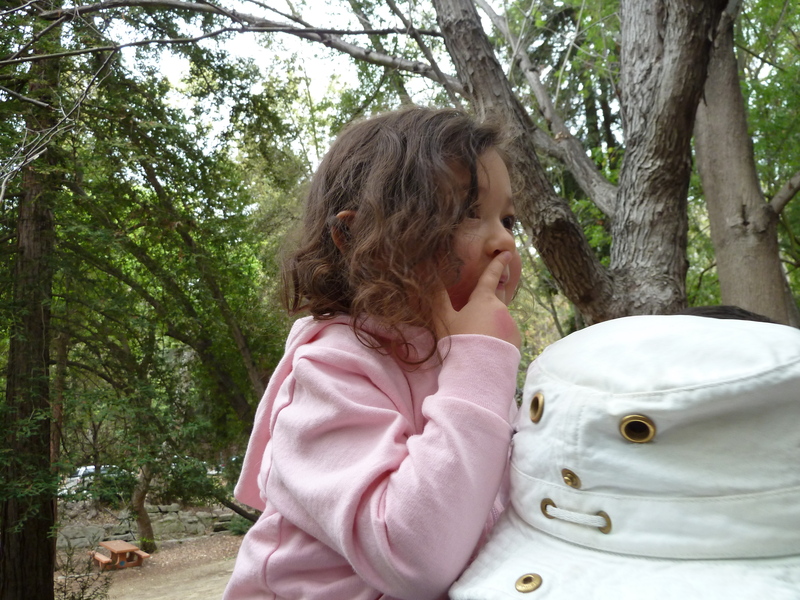 We heard sea lions, which Mishy said they were calling her name. When we went whale watching, my husband told her the sea lions were calling for her and she laughed then. The sea lions lie on the buoys on the Pacific Ocean. You could probably see dolphins and whales with the help of binoculars during their migration. 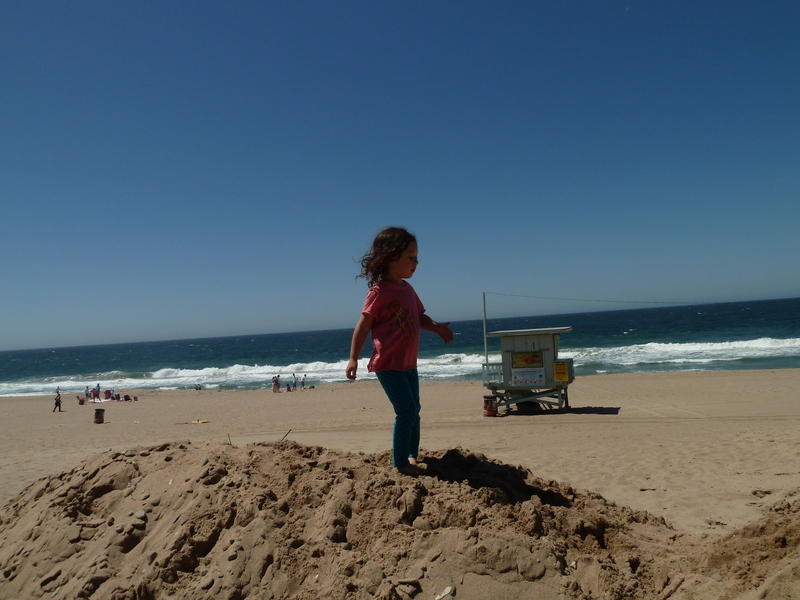 Mishy walking on the sand hill. The hike starts off the side of the beach. In the parking lot, where you pay anywhere from $4-$8, depending on the time of day and season, there were two sand hills sitting side by side of each other. 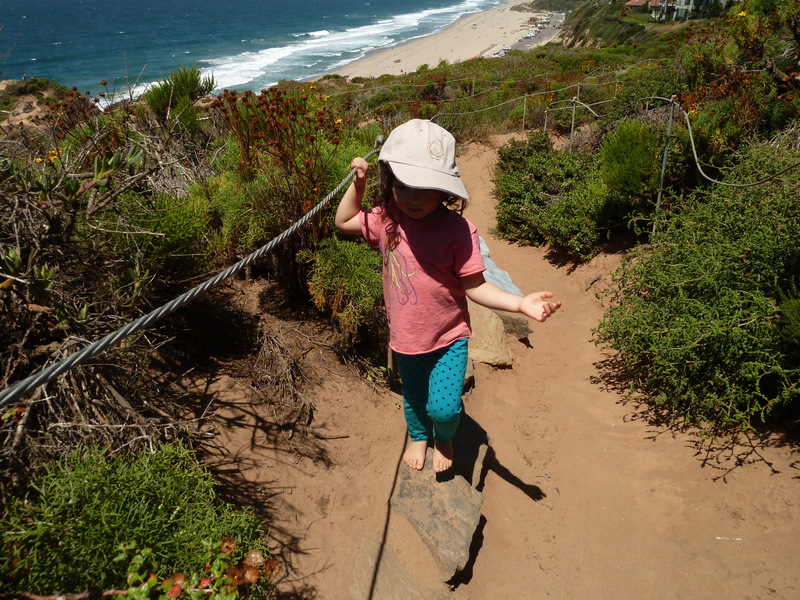 Mishy loved climbing up and down, along it, backwards and forwards while the group of homeschoolers went up the trail. We actually didn’t spend much time with them, since the timing was off. When we were headed up, they were headed down. We ended up doing our own thing, which is fun. It was interesting for me to note that I still felt the pull of the group, even though I didn’t know this group very well. It’s important to feel a part of a tribe. 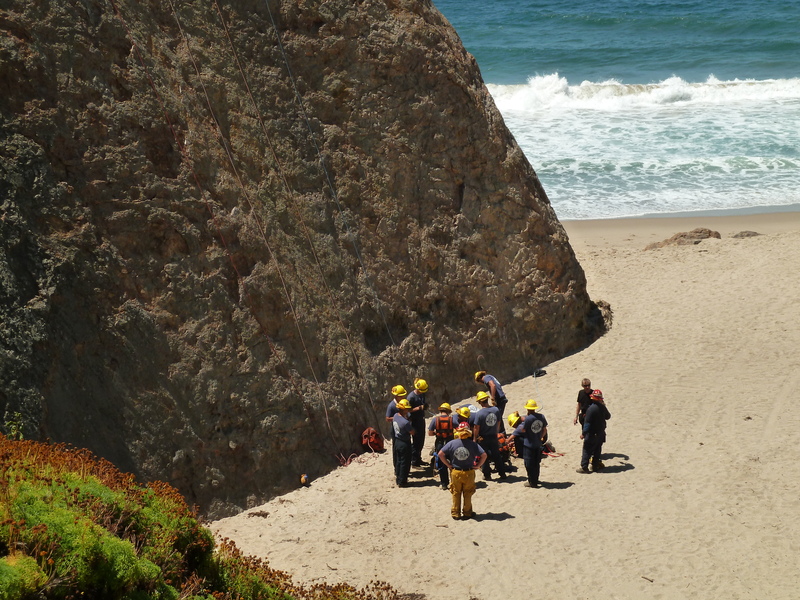 Firefighters practicing foe a search and rescue. As we climbed higher, we were privy to a group of local firefighters practicing for a search a rescue rally. While it was serious in nature, it did look like fun when they were repelling down the rock wall. Once upon a time, I did a little bit of rock climbing. That would be another fun thing to do with my daughter. Our daughter. My husband reminds me she’s our daughter. Mishy balancing on a rock while hiking. 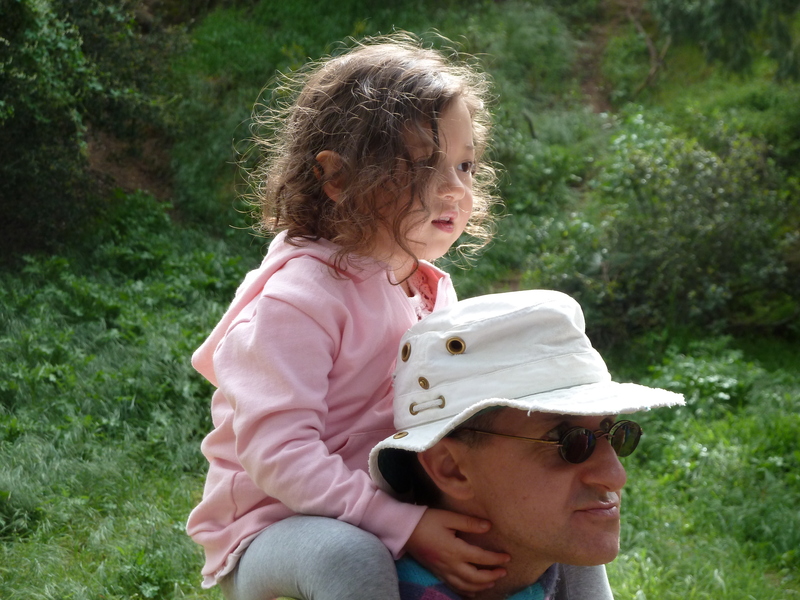 Hiking with a preschool aged child is much different from hiking with my husband. My husband and I used to hike a lot when we lived in Malibu – our backyard had a beautiful hike along the Santa Monica Mountains. The way my husband and I hiked was mainly for the exercise. 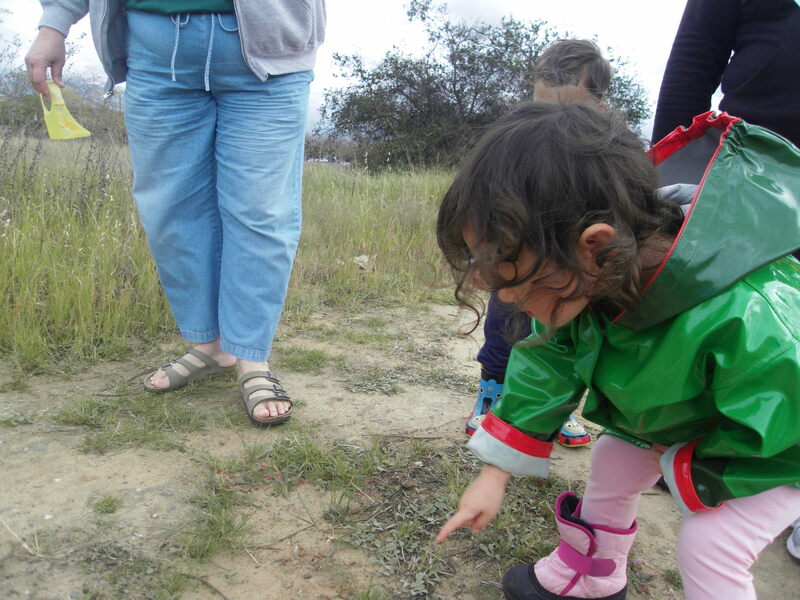 Hiking with our daughter, we stop a lot and play with the dirt, investigate the plants, and find animals – lizards, mostly. It’s a calmer and more focused hike. In The Moment Hiking, if I were to give it a title. 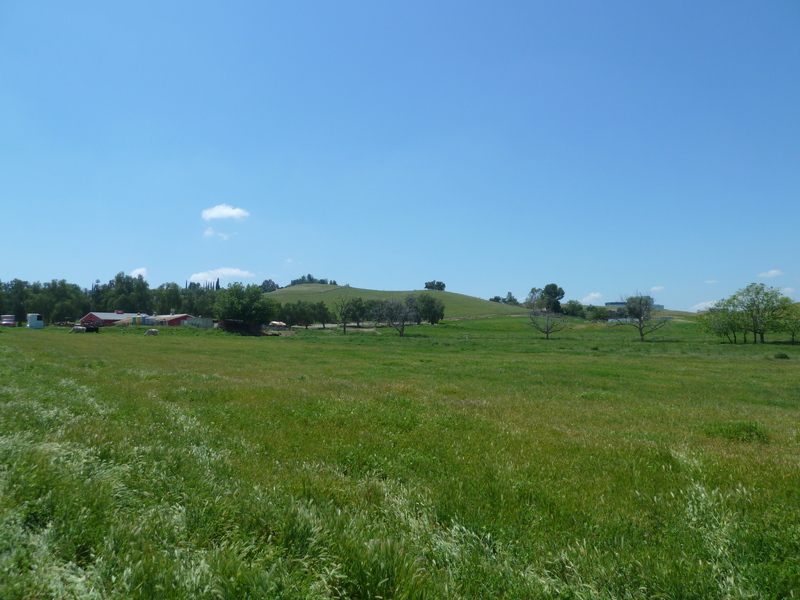 I impressed my husband when we attended Pierce College’s Farm Walk. 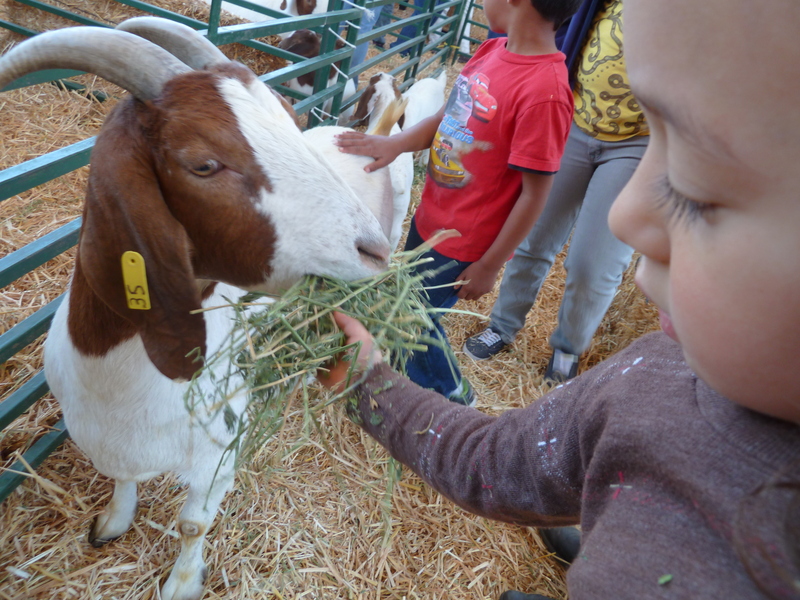 This is an annual event where they turn their 235 acre animal learning/teaching center into a farm. 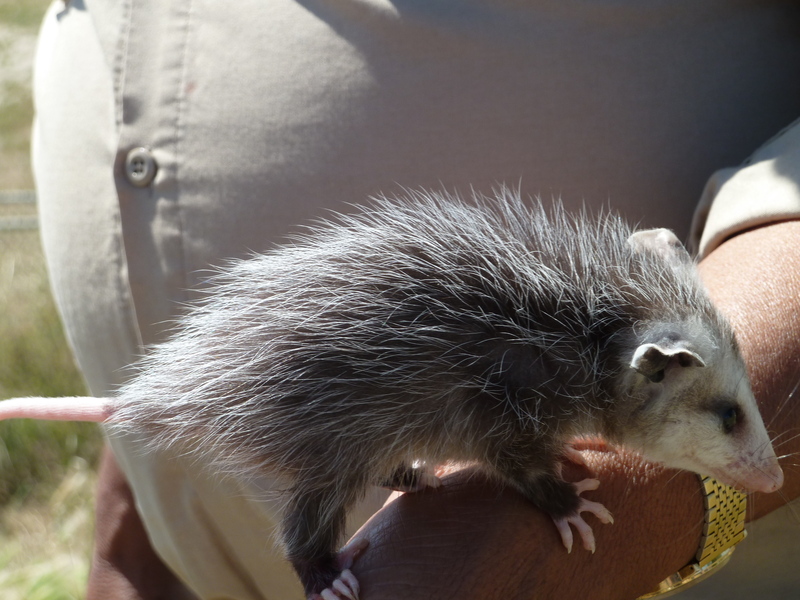 They had wagon rides, a petting zoo, an equestrian show, pony rides, students walking around with animals – a parrot, a python snake were two we saw, as well as food – including farmers market fresh strawberries, which we gobbled up, and a special surprise – a guest found a baby opossum. Mishy feeding the Momma goat. 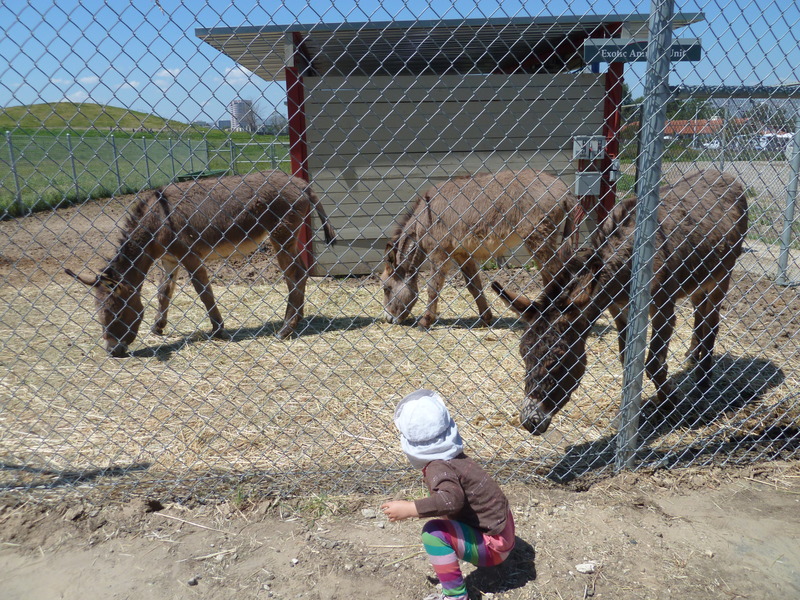 Mishy gathering hay to feed the wild burros. Pierce College recently brought the wild burros from Nevada to protect the goats and cows from coyotes. Coyotes are scared of them. They do sell the cows for beef to raise funds for their school. 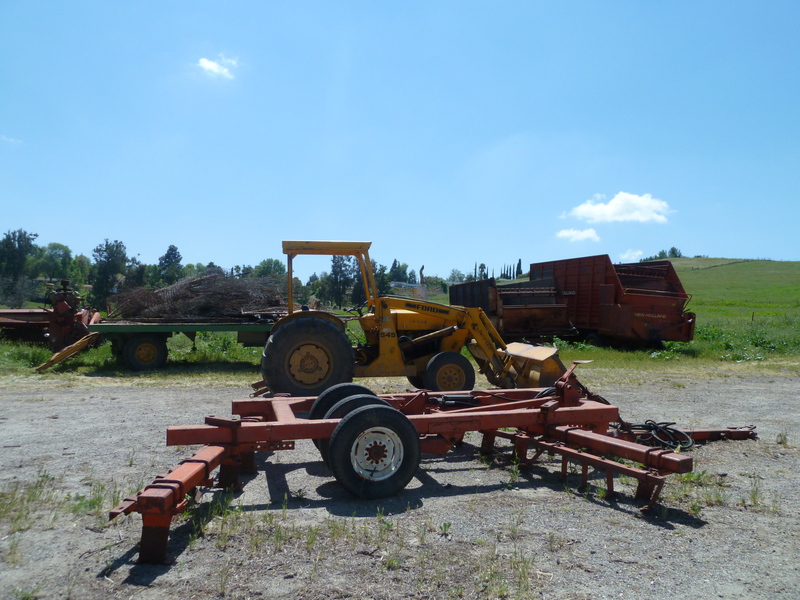 This Farm Walk is one of their many fundraisers they have throughout the year. Just to cover the cost of feed, they need to raise over $50, 000. Due to budget cuts, they have been forced to close down and lessen some of their stock of animals. They currently only have one pig because it was too costly for them. They did recently open up a chicken coop. 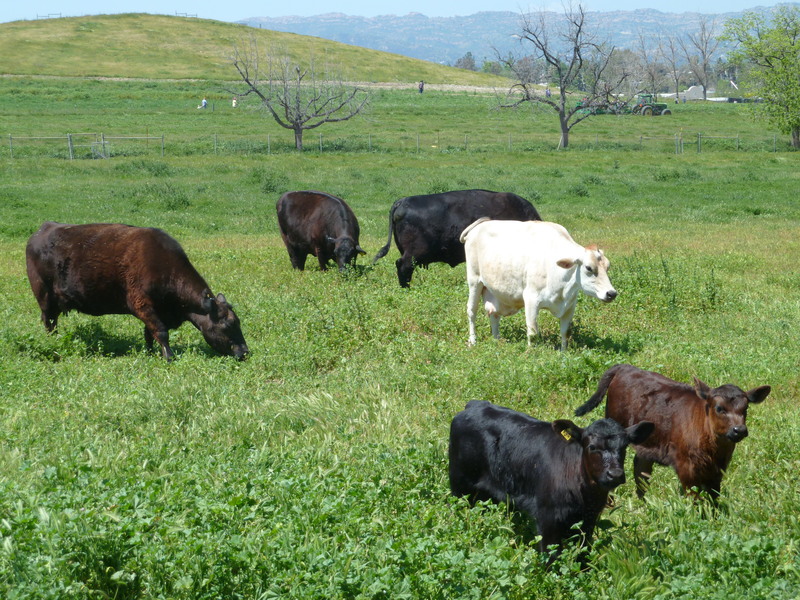 The animals are able to graze on much of their 235 acre property and the students are continuously planting seeds to grow into grass so they don’t just depend on hay as their primary source of food for the animals. 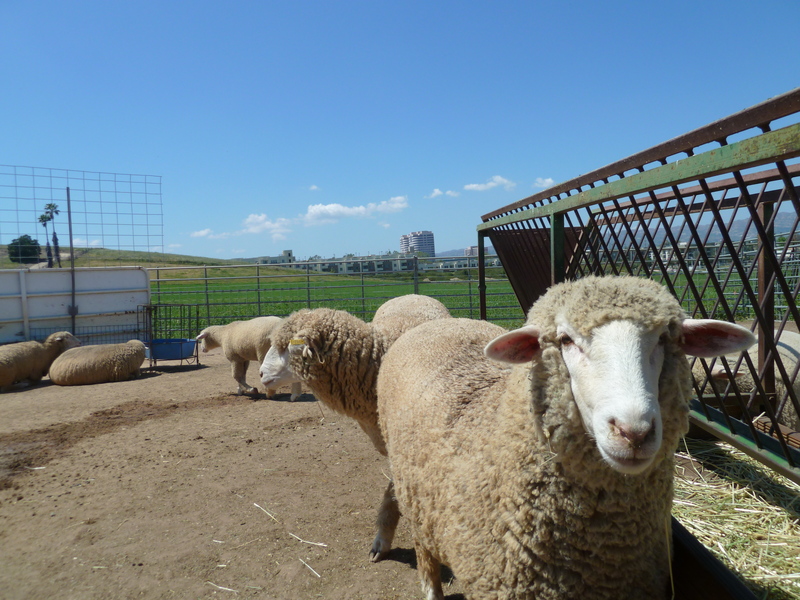 The animal college would like to become as self-sufficient as possible. 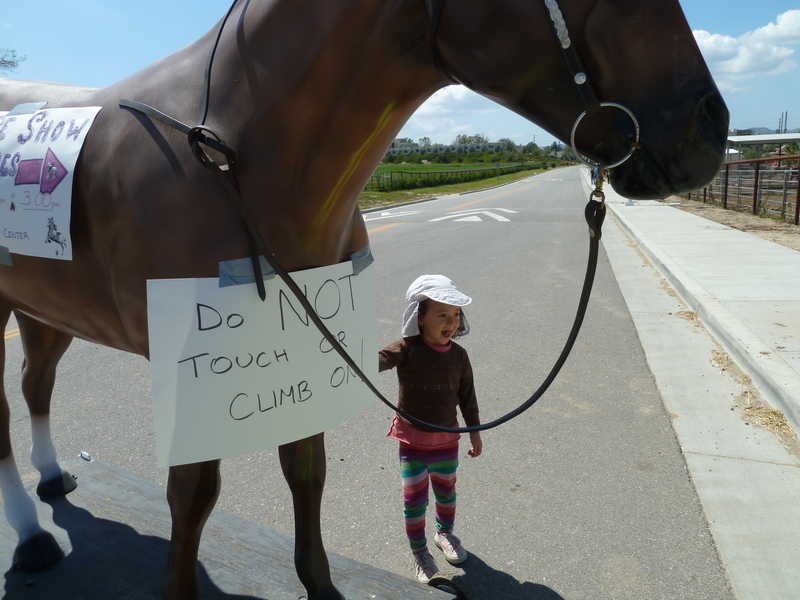 Touching the Do Not Touch pretend horse. Playing with the hoola hoop set for a pretend horses and children to jump through. 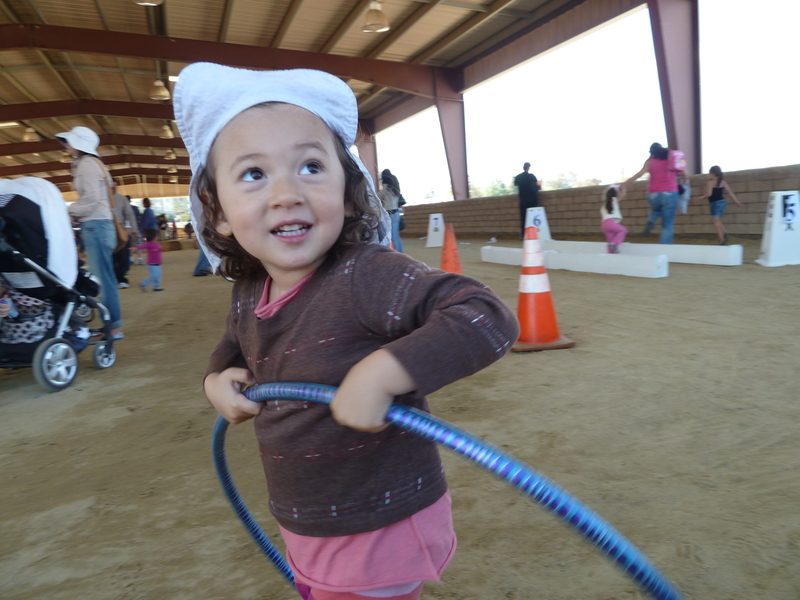 Farm folk, fire fighters and the Forestry Division of the Los Angeles Fire Department, and the group, California Woman for Agriculture and Agriculture in the Classroom were also on hand to answer any questions. 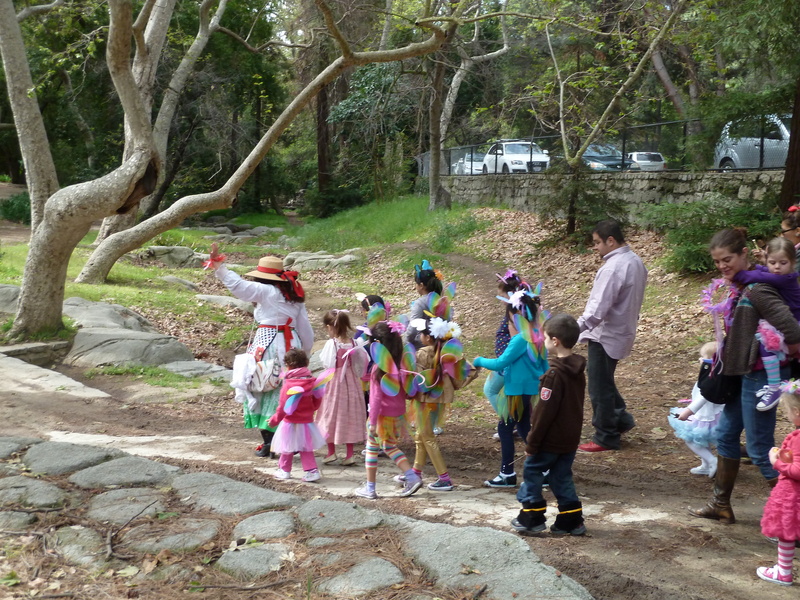 Last Saturday, we were invited to go on a faery hunt at Griffith Park in Los Angeles. One of my daughter’s favorite pop up book is, How To Find Flower Fairies, research conducted by Cicely Mary Barker. 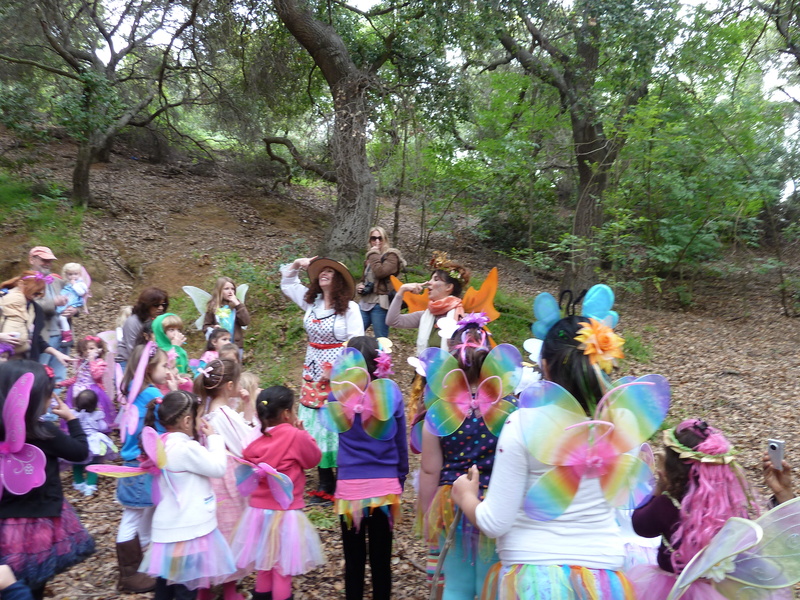 Here is a photo essay of our time at the faery hunt. Below are details of the giveaway. 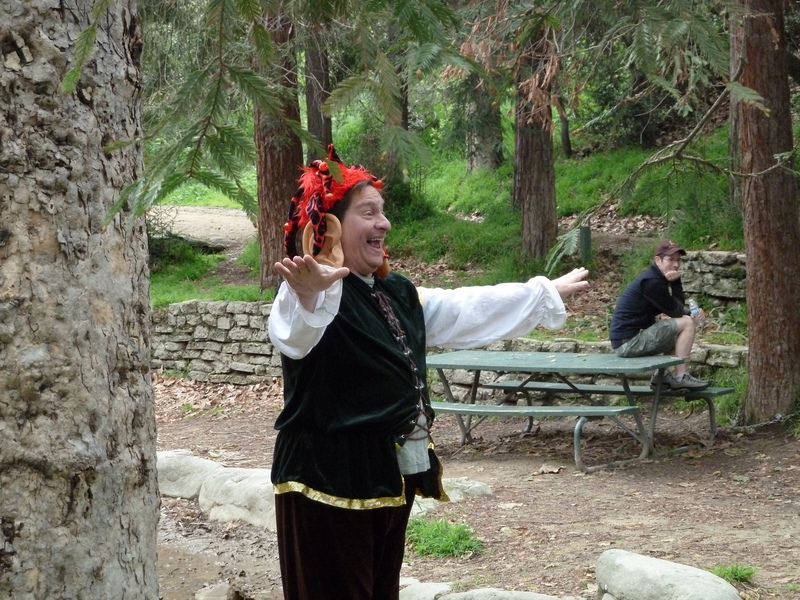 Auntie Angelica Root welcoming the faery hunters. Down the path to start the search. 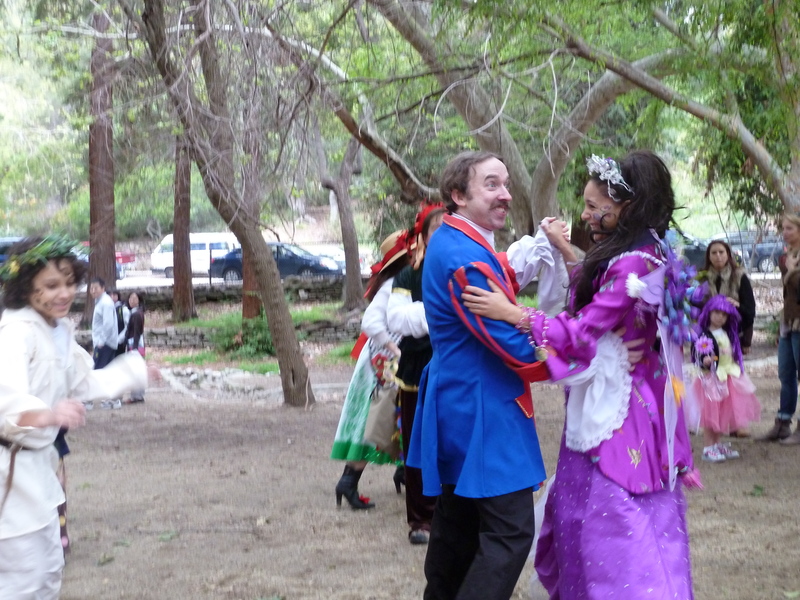 We meet Boon, the faery of friendship, who accepts our gifts. Boon tells us to get to Faeryland, we touch our nose and jump. Mishy touches her nose to get to Faeryland. We find the Faery Queen who tells us she is missing her light. Searching for the Faery Queen's missing light. Does Troll have the missing light? Does Half Man, Half Bird have the missing light? 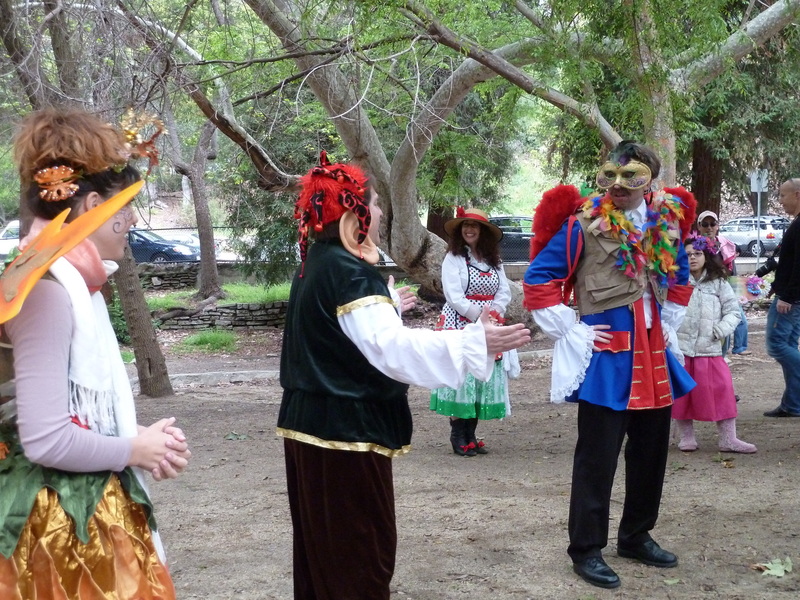 The Faery Queen releases the spell on Half Man, Half Bird and they dance. She receives her missing light and all is well. 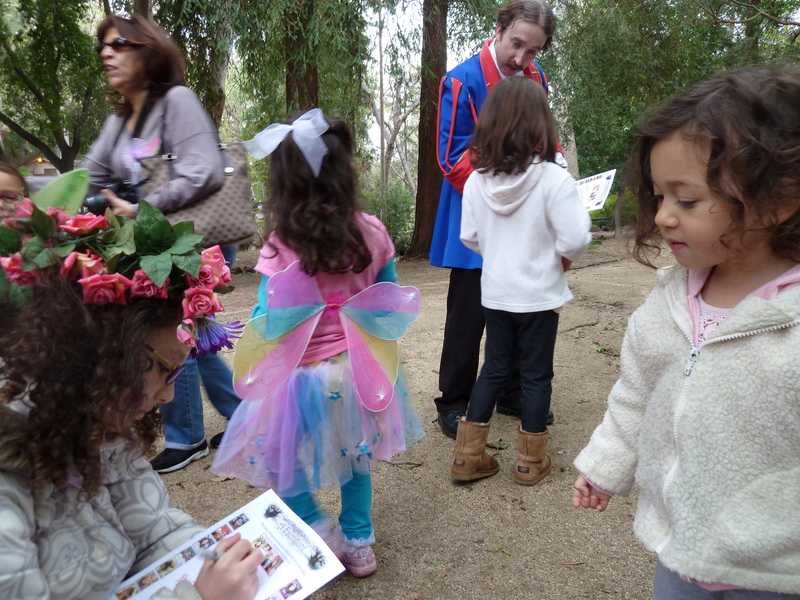 Sparrow signing Mishy's Faery Certificate. 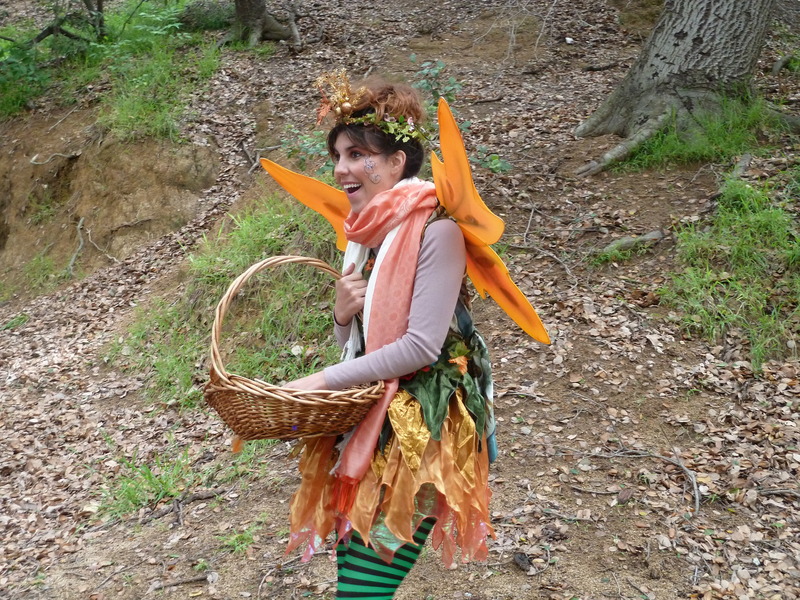 Natural Traveling Momma is excited to be giving away two tickets to see any upcoming show of The Faery Hunt, an interactive outdoor adventure which is the winner of Nickelodeon’s Parents’ Picks Award for Best LA Children’s Theater. To enter, comment below. 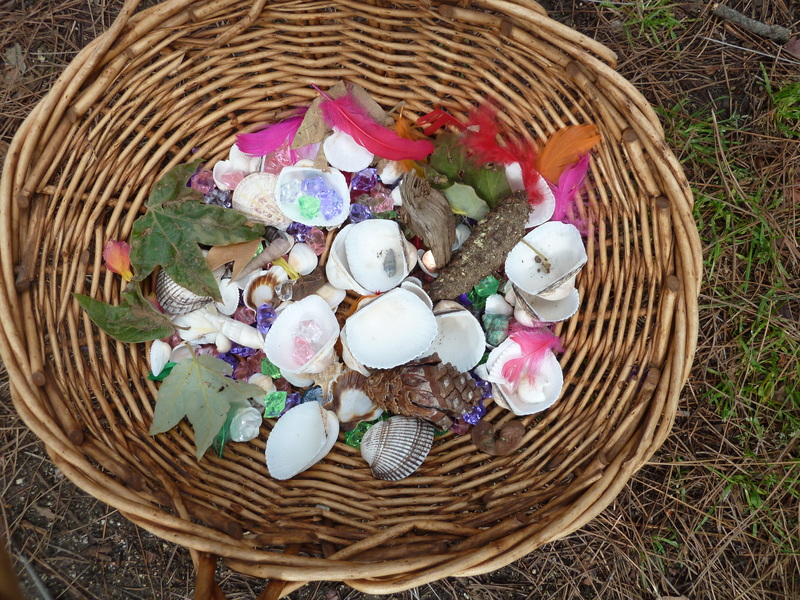 For an additional entry, click on to a Faery Hunt’s link and then place another comment below. The contest ends April 25th at 5PM. Good Luck. 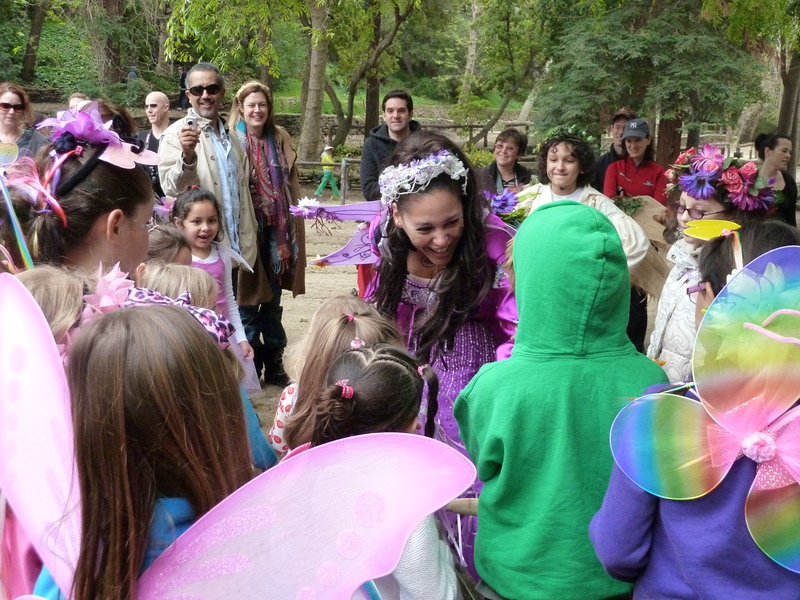 Faery Hunt is a not for profit organization which visits hospitals. They also offer different birthday party options. 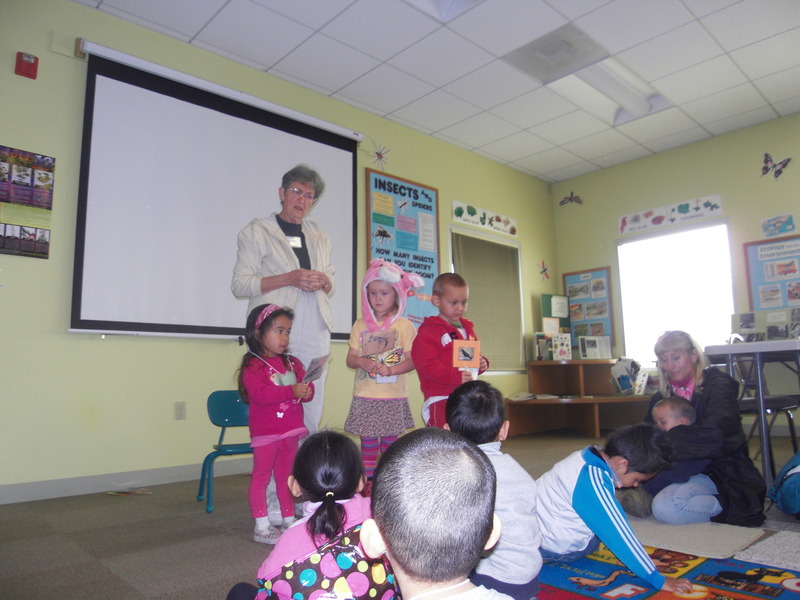 On Friday mornings, Cindy Reid hosts a program for 3-6 year olds called Friday Fun. We’ve had the pleasure in participating in two Friday Funs. 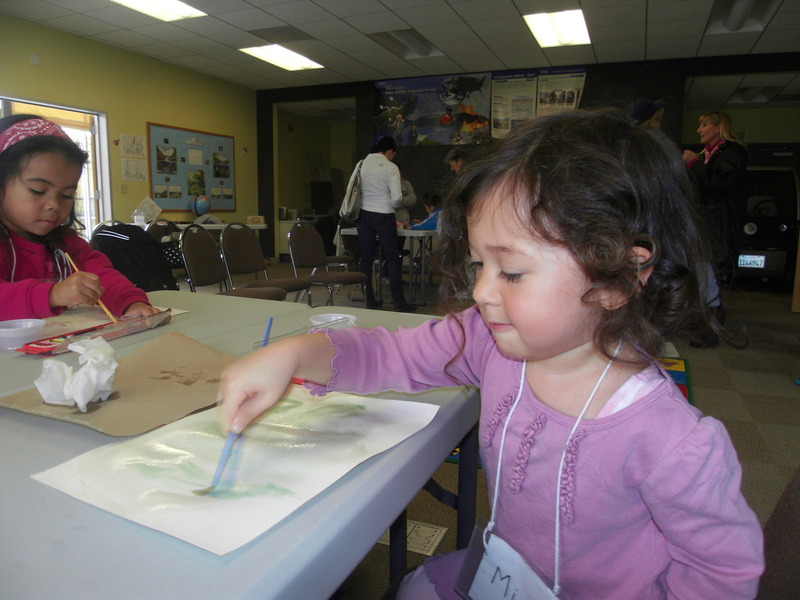 Friday Fun consists of an overall theme regarding nature. 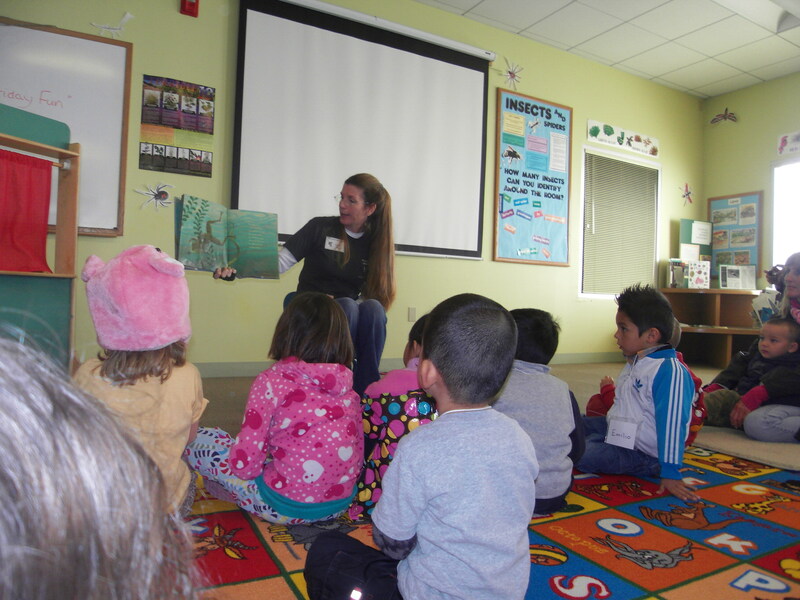 After the children find their name tags, they sit on a carpeted area while Cindy reads them a book related to the theme of the day. 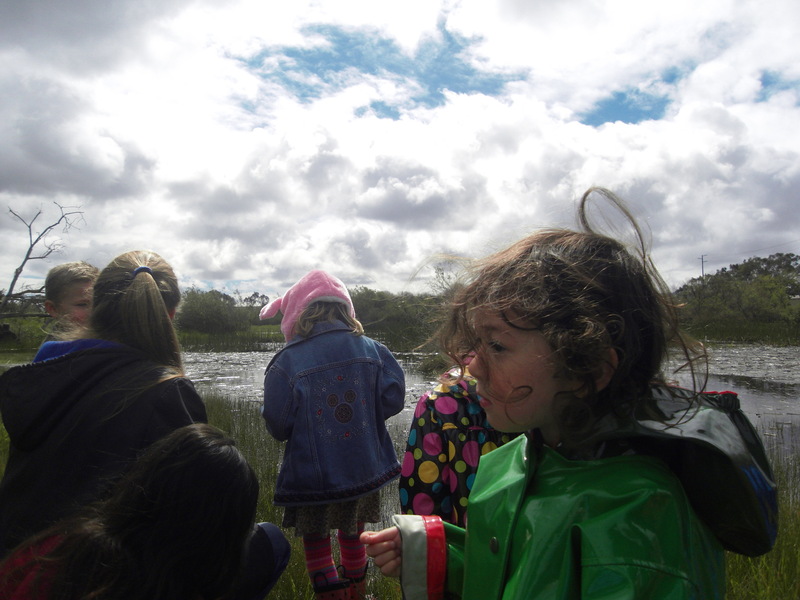 When we went, the themes were the marsh and springtime flowers. 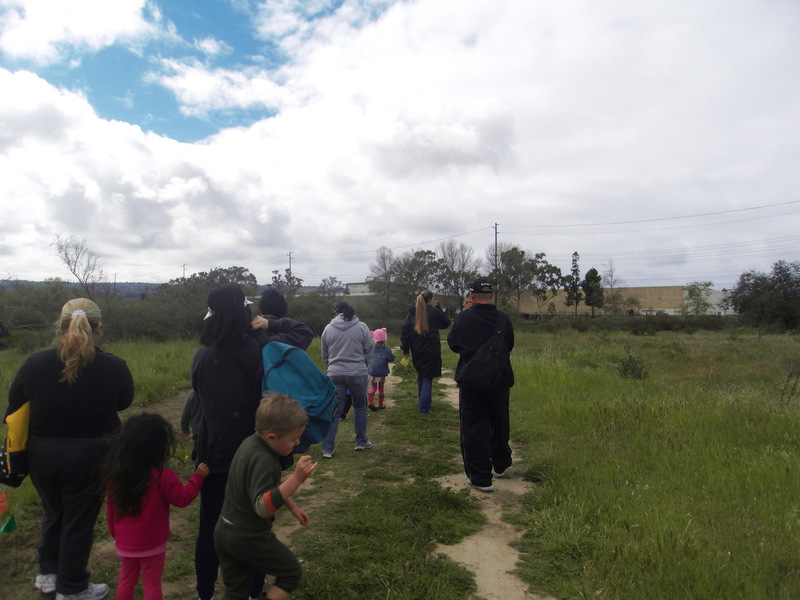 A fun learning activity such as demonstrating the food chain follows and then a puppet show, an art exploration and finally, a hike in the marsh. The teachers are incredibly dedicated to letting the children learn and experience in their own way and it reminds me of the science camps I loved attending when I was younger. Here is a photo essay of our days there. Cindy Reid reading a story. Carol demonstrating the food chain in nature. 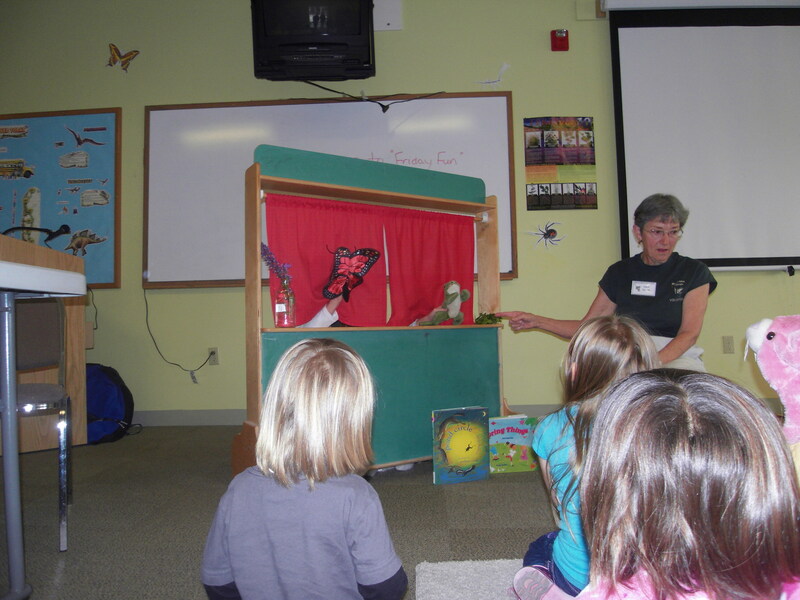 Cindy Reid performing a puppet show about the food chain while Carol and the children watch. Mishy creating nature inspired art. 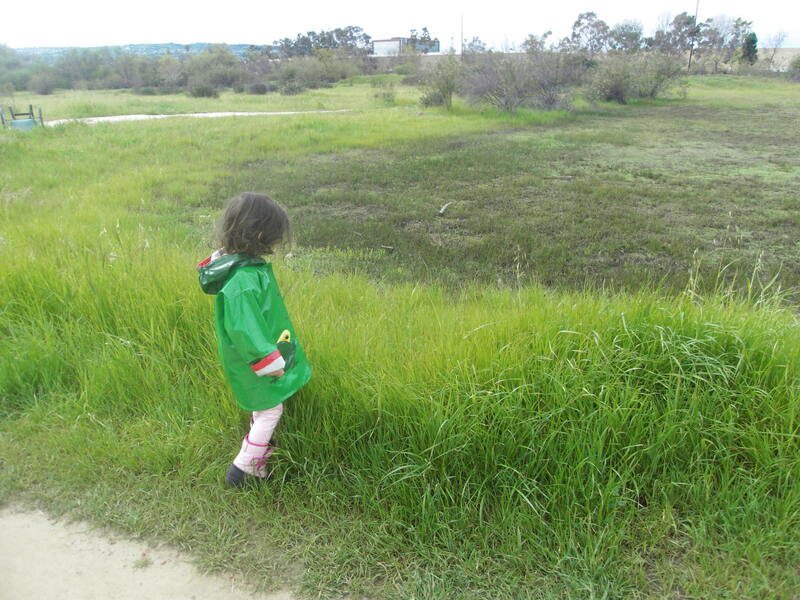 Looking at the marsh on our hike. 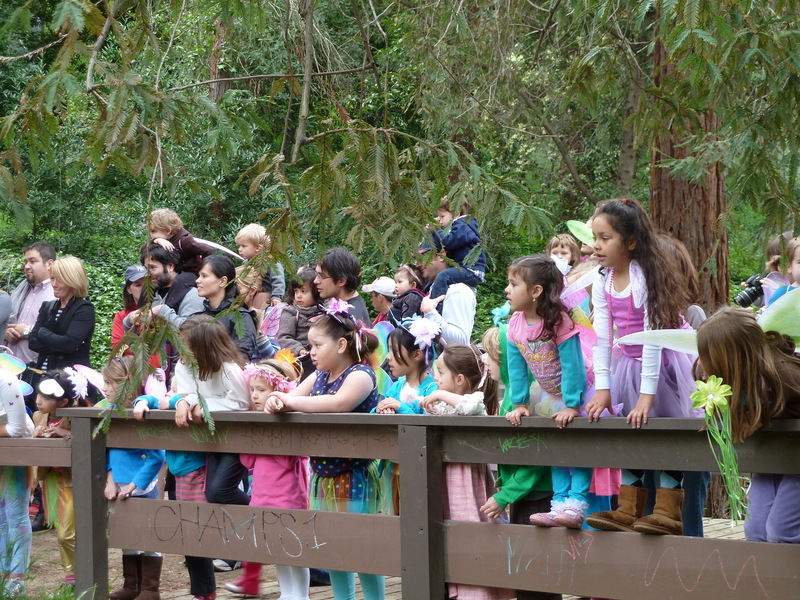 The group of children, parents and teachers on the trail. 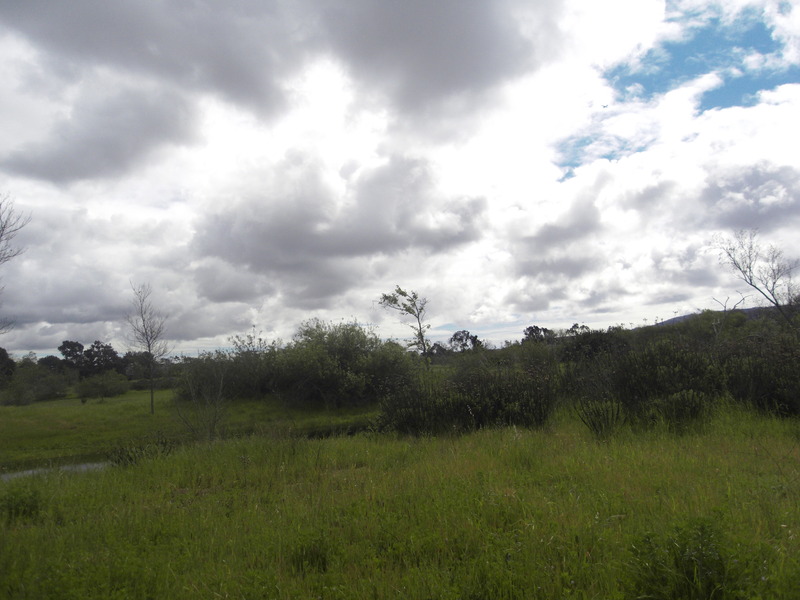 The clouds on the day of our hike. 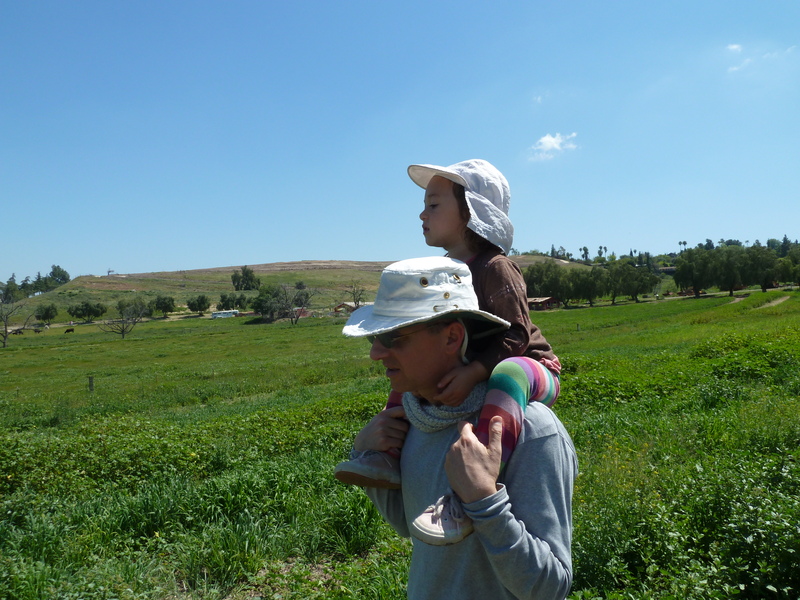 By the marsh to look for insects. Looking for insects in the water. 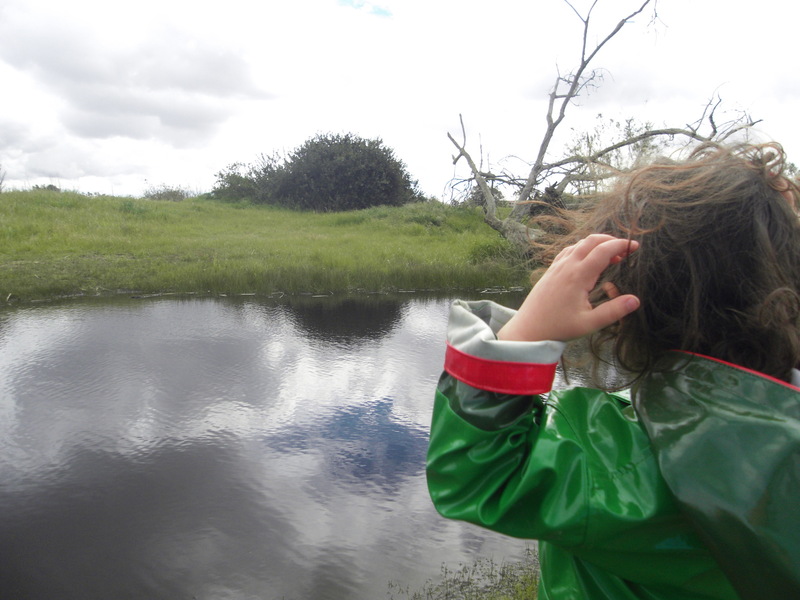 Mishy standing by the marsh. 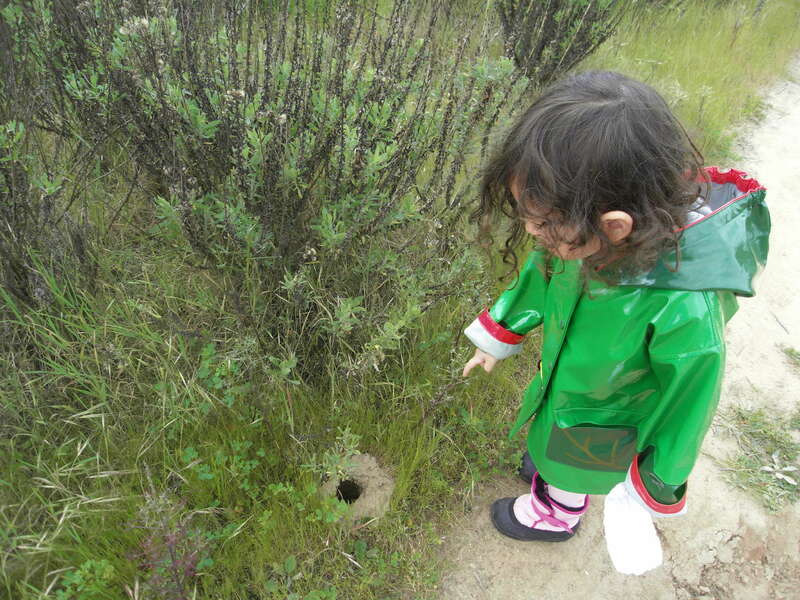 Looking at gopher or mole holes. 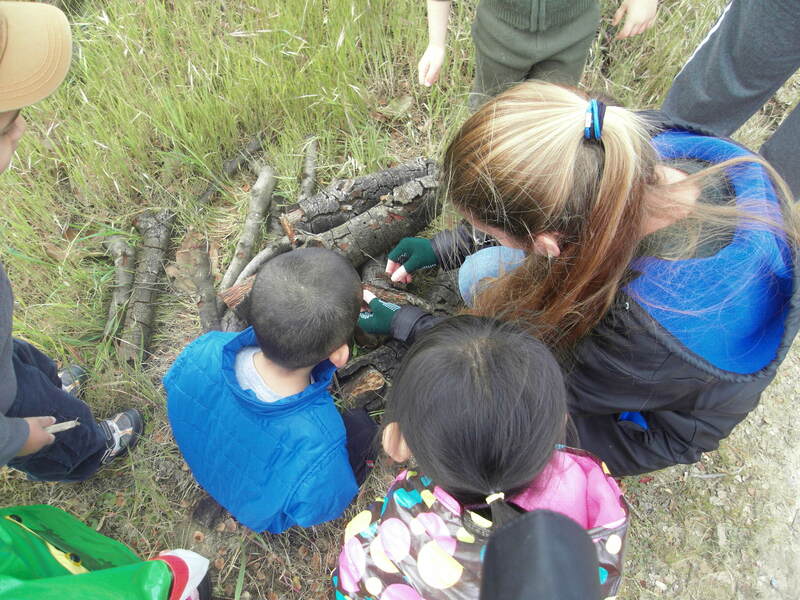 Looking for the FBIs - fungus, bacteria, and insects. 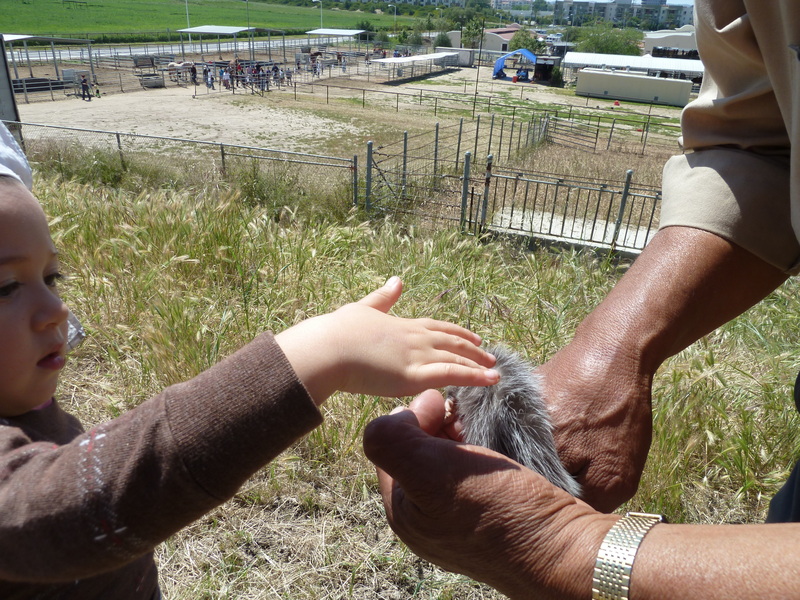 Mishy points to a mole hole. 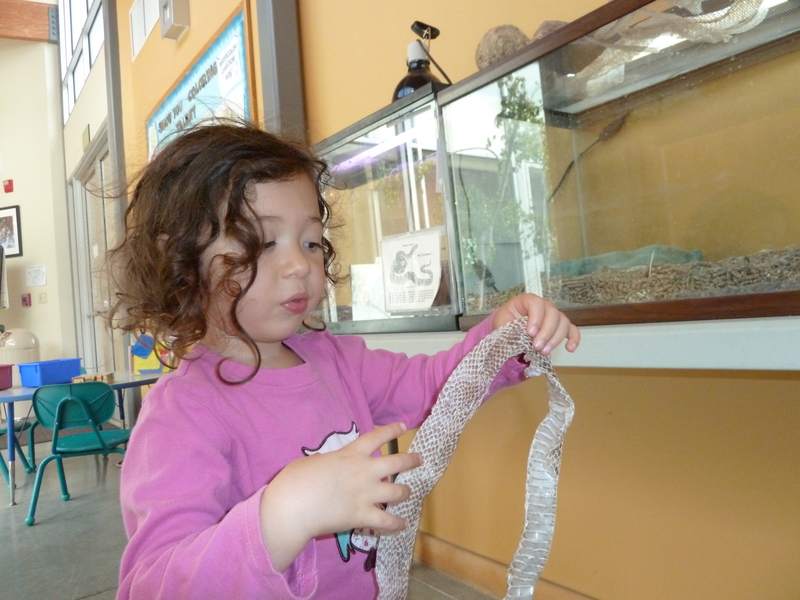 Mishy touching the snake skin on display inside the nature center. 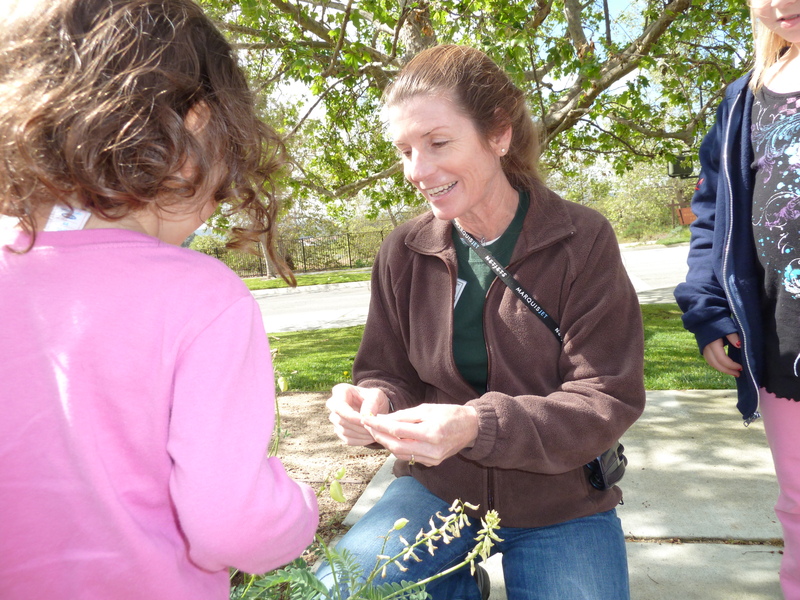 Cindy Reid showing Mishy the seeds in the spring flowers. Lori, M, and Mishy looking at the young blossoms.